New No Setup IC "Jump Desync"
Fly Amanita mentioned a desync he had found while messing around - he had managed to make Popo (or whichever ic the player is in control of) jump by himself without any prior setup. After several hours of testing with Ryan Reagan, we were both able to pull it off with some consistency. The desync can only be done with the control stick. Tap jump only. Take that, people who want to turn tap jump off! From a standing position, the degree of Up input that needs to be input on the control stick is 181. Any higher (182-256) and Nana (computer controlled) will also jump. Any lower (180-0) and neither climber will jump. [Fly notes] It is definitely easiest to do this out of a walk. [Sleepy notes] Doing a "reverse shai drop" motion has given me more consistency with this than any other method. Note: If you short hop, Nana stays within sync range. gfycat of Dolphin inputs - first 180, then 181, then finally 182. [Fly notes] Nana wouldn't WD since she doesn't jump anywhere, but she should at least shield due to the trigger input. That could still be useful since you could tell her to jump and blizzard OoS while Popo is still in landfallspecial. edit: or something other than blizzard, but that appeals the most to me by far of the options I immediately see. Many thanks to the many people that helped test and figure this desync out. but fly amanita said he'd look into it later. If you can wavedash out of that jump consistently you are officially a god. Tuesday, i think if you WD'd out of it, nana would stay synced and she'd WD anyway. Nana wouldn't WD since she doesn't jump anywhere, but she should at least shield due to the trigger input. That could still be useful since you could tell her to jump and blizzard OoS while Popo is still in landfallspecial. This is awesome. Time to get in the lab. At least some of the oddities present with the joystick are also present with the C-stick, e.g. if you hit up on the C-stick with a vertical value of 181 while the stick is horizontally neutral (i.e. has value 128), Popo alone will usmash. I'd expect behavior to be mirrored very closely, but I'll look into it more. edit: dsmash works similarly with (128, 75) (I'm just going to use (x,y) coordinates in the obvious way for the sake of typing less henceforth). edit 2: you can also have Nana alone dsmash if you're initially holding (128,75) and switch to something much smaller vertically; (128, 7) is what I observed and I haven't checked anything else yet. I'd assume you could get Nana to usmash alone in a similar way (or jump alone with the regular joystick, or C-stick OoS). edit 3: It looks like the C-stick behavior is that (128,y) yields a Popo dsmash for any value of y less than or equal to 75 and a Nana dsmash for any value less than or equal to 74. Probably similar for usmash. edit 4: behavior is similar horizontally; (192,128) yields Popo fsmashes to the right, (193, 128) yields Nana fsmashes to the right. last edit for this post: I should mention that you don't need to worry about how quickly you're moving the C-stick, which is a concern with the left joystick. that being said, does this give enough of a speed advantage over up-b OOS to warrant the decreased consistency? I'm currently looking into messing with what the game parses as the C-stick's neutral position to see if I can get free desynchs more or less whenever I want. For example, if I can get the game to think the C-stick in neutral has a vertical value of 75, then I could do Nana-only dsmashes whenever I want, at the cost of not being able to C-stick dsmashes with Popo. Conveniently, 75 is outside of the range at which the C-stick buffers spot-dodges, so I wouldn't need to worry about ruining Popo's shield. Fly if we can desynch from an upsmash without setup that's amazing. All this tech you find holy ****. I'm going to make a more condensed and more clearly thought out video on it later. Cool, if youre gonna test this with upsmash, just jumping with nana oos shield can be something interesting to try, i know the shieldlag desynch but maybe the csticktrick can make it easier to make just her jump. Jumpcancelgrabs would be cool but i assume that wont work since it involves z making popo also grab. While it would be awesome to do Nana-only jumps OoS with the C-stick this way, the C-stick will continuously buffer jumps, so the smallest y value for the C-stick that makes Nana jump OoS (182) still makes Popo jump as well. And yeah, I've been thinking of the applications of a solo usmash outside of just starting desynchs and it does seem like it'd have lots of nice applications like that. For example, I'm usually hesitant to use it as an anti-air against Fox because of its lag, but if only Nana is doing usmash, it suddenly becomes much safer. It'd also be a nice way of trying to get under characters with high short hops, but it'd beat more things than the standard synced usmash. For example, if Falcon shields when you do a synced usmash, he is safe, but if he shields a Nana-only usmash, Popo can easily grab him during shieldstun. I remember reading an IC thread a while ago about how you can solo smash by only flicking the c-stick to a diagonal (with a slight lean towards the smash direction). It's cool to get some numbers. They may have only been talking about fsmash too, but I thought it was all smashes. I probably should have realized this earlier, but doing this with usmash is kind of annoying since any shield input makes Popo jump OoS unless you manually move the C-stick to account for the calibration. Fsmash similarly will make you roll. I like the dsmash set-up the most since it lets me shield normally even if it does complicate grabs. I also realized today that with such a set-up, you can have either IC do a solo smash. For example, with the usmash set-up, I was able to make it so that a very slight tap downward on the C-stick with Popo would usmash (as the y-value would drop below 181 and then rise back to that exactly), and a slight tap upward would make Nana alone do it (as the value would change from 181 to 182+). Fly how do we do this RTA? Note that the "READY TO FIGHT" bar obscures the lower white boundary of Peach's portrait, which doesn't happen if the y-value is too high. If it's too low, then the inner, lower corners of Falco's and Young Link's tiles aren't blocked by the "READY TO FIGHT" bar. That said, it'd also be good to know what the CSS should look like before you reset the controller to reduce trial-and-error to reach that point, but I haven't done that yet. I checked on a couple different browsers and it works for me. If you're referencing that the whole CSS isn't shown, I was lazy and only bothered to show the part that displays the visual cues I use. It was my browser, thanks. So is the plan to muscle memorize that specific angle? uuuuuuuuuugh now I have to actually practice something again. that involves playing my main. The way a tiny bit of Mewtwo's head pops above the "READY TO FIGHT" banner is how I identify this. This is kinda cool. You can do stuff like jump -> aerial -> move the c-stick to the left/right and slide it down to the "corner". From here you can make Popo only do a d-smash by moving the c-stick a tiny bit down. I can do SH Bair (with c-stick) into desynced d-smashes this way rather consistently. I still can't do it fast, however. For the 'Nana only' desync variation I think dash-dance desyncs are better/easier. Like, dash -> dash -> let go of control stick -> press down -> press up on c-stick. This way only Nana will do an up-smash while you have full control over Popo. Might as well post the video I made on the C-stick stuff here as well; it's kind of long and is largely stuff already present in this topic, but it does show some examples of things that can be done with specific C-stick calibrations here and there. So what kind of things can you do with this new tech? I was entirely down with adjusting playstyle for c-stick until I saw that it ****s up grabs. I'm gonna try for the muscle memory cause I'm stubborn. Instant desynchs whenever without setup can lead into creative combos, follow ups, easier edgeguards, whatever you can basically think of. It doesn't screw with grabs if you set up usmash desynchs out of neutral instead of dsmash. 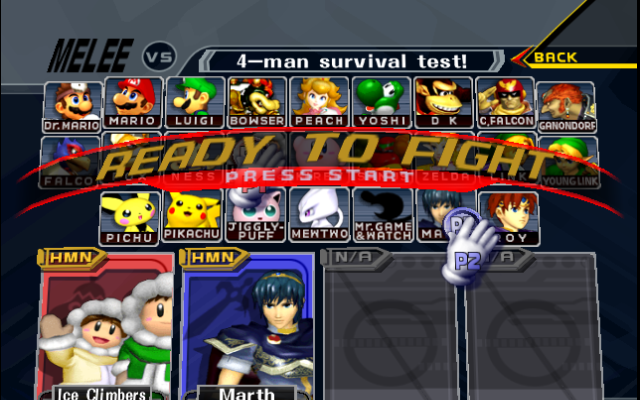 I probably should have mentioned this, but since the desired difference from neutral is 53 vertical units for both set-ups, you can just switch the roles of the two pictures in the dsmash set-up to do the usmash set-up, that is, try to mirror the high banner CSS picture before the controller reset and have the low banner afterwards when the C-stick is in neutral. Just a thought, what if you have another player who is screwing with the screen tilt angle while you're trying to do your calibration? It's not like you can tell them to stop if they don't... can you?